The Kilgore Engineering Laboratory is available both to support the ongoing research of KSI, but also to outside groups that require laboratory services. We have opened our state-of-the-art facilities for outside groups and can host your forensic laboratory exams as a neutral third party. These services include access to any of our microscopic or X-ray imaging capabilities and complete metallurgical preparation equipment. This can be a one-stop shop, giving your failure analysis any tool or equipment needed for the job at hand. As our primary expertise is electrical failures, we also have a full complement of electrical test equipment. We can test circuit breakers up to 2000 amperes and have specialized equipment used in electrical component failure analysis including relays, transformers, motors, and limit controls. We also have metallurgical preparation equipment with horizontal and vertical band saws, and a diamond cut-off saw. Samples can also be mounted, polished, and etched for viewing with the Leica metallograph. KSI also has capabilities to test for hardness and micro-hardness. 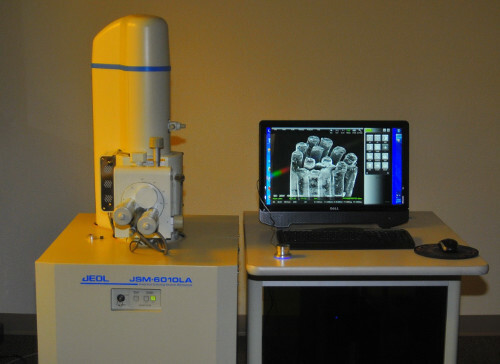 We are pleased to offer a JEOL JSM-6010LA microscope. This is a state-of-the-art instrument that has detectors for secondary electrons, backscatter electrons, and energy dispersive spectroscopy (EDS). The magnification range of this instrument is 8x to 100,000x. We also have the capability to operate this instrument in low vacuum for non-conductive or biological samples. 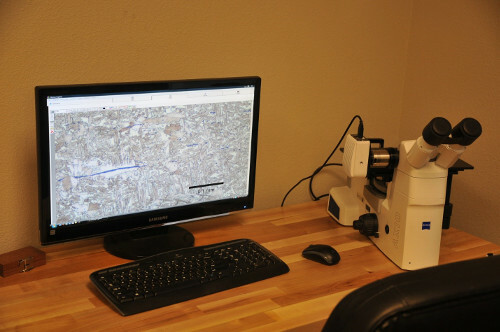 We have the capability to make the microscope screen available for remote, web-based viewing. Samples can be at the lab in Colorado and viewers could be anywhere with an internet connection. Directions for analysis can be delivered in real time and the data shared via a web portal. Secondary Electron Imaging creates a high-resolution, high depth-of-field image and gives excellent surface definition of the sample. This is good for imaging purposes to see fracture surfaces, surface features, particle sizes, or porosity. Backscatter Electrons give data about the different elements that may be scattered in a sample. The grayscale of the image will change depending upon the atomic wait of the target. This allows for identification of materials within a sample that may not be homogeneous. Our scanning electron microscope is equipped with a silicon drift detector (SDD) EDS. This equipment identifies what elements are present within a sample and to what percentage they are present. This is helpful in the identification of materials as well as the presence of contaminates. 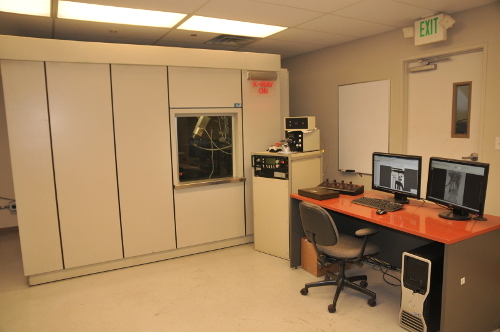 Our SEM operator has years of experience in scanning electron microscopy. The highest resolution imaging available within the Scanning Electron Microscope requires an electrically conductive sample. If a sample cannot conduct electricity, it will hold an electric charge when bombarded with electrons by the microscope. A charged sample prevents detailed imaging. To prevent this problem. We offer a palladium sputter coater to coat non-conductive samples with a microscopically thin layer of palladium. This layer dissipates any charge produced by the electron microscope and allows for complete, high-resolution imaging. Because palladium is rarely found in samples, it can be ignored during elemental analysis. 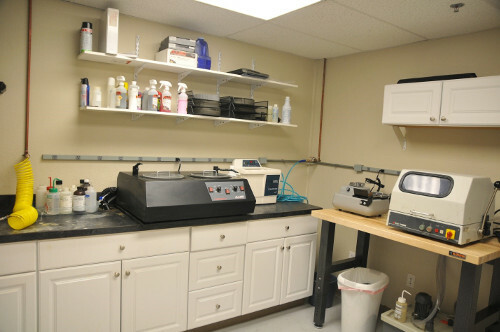 The laboratory includes the capability of complete metallurgical sample preparation including mounting, polishing, and etching equipment. A Leica metallograph views and documents the metallic grain structure. We also have horizontal and vertical band saws and a diamond cutoff saw. KSI is truly an independent metallurgical lab. We offer only metallurgical sample preparation. If metallurgical interpretation is needed, we would be glad to recommend a qualified professional. A Stereo Microscope offers a magnified image to both eyes to provide a 3-dimensional image. It is very helpful in visualizing surface features of small items. We offer a range of stereo microscopes that have various magnifications and light sources. While these microscopes have the capability of photographic imaging, better images (with precise scaling) are available with the Digital Microscope. We currently offer a Keyence Digital Microscope, Model VHX-1000. This is a very useful tool for microscopic documentation. The power comes from the high depth of field and direct integration of the stage and lens information. The microscope is digitally controlled. The automatic stage moves up or down while capturing images. From knowing where certain portions of the sample are in focus, the microscope can present an image with height information. The microscope creates a 3-dimensional surface image of the part. The microscope uses the scale of the image from the lens to create precise, 3-dimensional imaging. Both two- and three-dimensional measurements are possible. KSI offers two distinct x-ray imaging systems that have differing applications to allow us to provide imaging to fit almost any need. A real-time x-ray system can give very precise, ultra-high resolution x-ray imaging. This differs from standard x-ray in that the part can be manipulated to get the “perfect” image. For example, using remote parts manipulation, a part can be rotated with 0.01 degree precision for imaging. Also, moving parts can be captured with real-time x-ray videos. This system is housed in an interlocked, lead-lined cabinet that is 10 square feet. The size can accommodate very large items and the manipulator can move items up to 50 pounds. Because our x-ray source has a spot size of less than 10 microns, object can be moved very close to the source and image with very large x-ray magnification. This allows us to visualize internal components invisible to the naked eye. Another unique feature is a horizontal x-ray beam. This allows the part to be imaged in the normal viewing angle and rotated around the vertical axis. This machine is perfect for detailed x-ray inspection of potentially failed components. We can offer both remote viewing of the real-time x-ray via a web-conference or a complete, automated, 360-degree rotational view of a discrete part. Our standard process yields an image every quarter degree for 1440 images as the part is rotated very slowly. This can be done with parts shipped in for x-ray inspection. We offer a digital, flat-panel x-ray imager for imaging larger or denser items. This system differs from other systems in that full-resolution x-ray images are available within seconds. Most other systems require time-consuming scanning of x-ray plates that can take up to 15 minutes for each image. This system is used for a 2-dimensional, static x-ray image. The image covers roughly 11” by 14” and can penetrate up to ½-inch steel. Due to the speed, we are able to use x-ray imaging for purposes that can cut hours off of a typical examination. For example, hours are often taken searching fire debris for a discrete part that is needed to fully analyze a product. Within seconds, a digital, flat-panel x-ray image will tell if that part is present within a full bucket of debris.